Calamagrostis are some of the most useful grasses in landscape design. They have a stiff upright look and generally look better when grouped. They are cool season grasses, greening up very early to provide a nice foil for spring flowering perennials and bulbs. They should be divided in early spring. Calamagrostis brachytricha has very upright green foliage that maintains good form all summer. 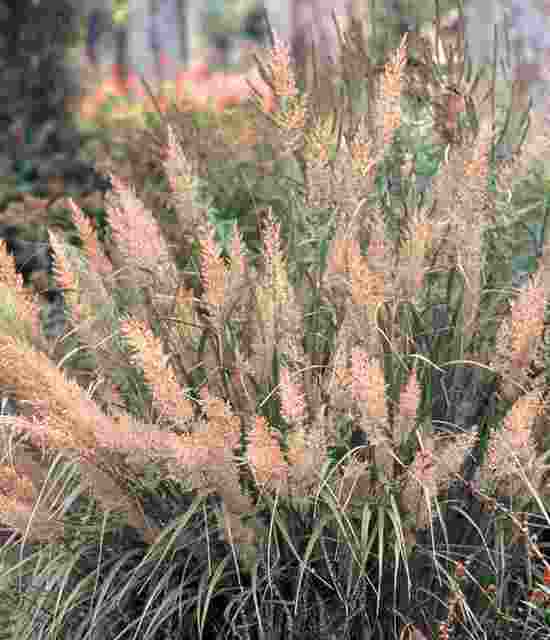 It is one of the very few tall grasses that can handle some shade, although it will thrive in sun as well. In shade its form will be a little more relaxed. The fluffy bottlebrush plumes are very showy, emerging with a pink tinge and then aging to tan. The foliage turns yellowish beige in the fall. This species of Calamagrostis grows naturally in moist, deciduous woodlands so it is adaptable to more shade than most tall grasses. It prefers a rich, moist soil that does not dry out. In more sun the habit will be tighter and it will flower more. It will adapt to any type of soil from sand to clay. Cut it down in the very early spring and divide it in the spring. It is a cool season grass so growth will begin early in the spring.